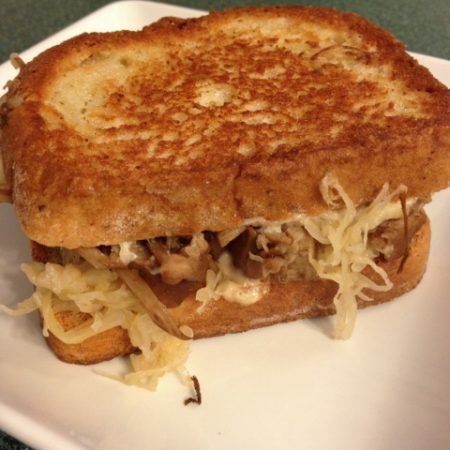 Jackfruit Reuben Sandwich, gluten-free, dairy-free and vegan! 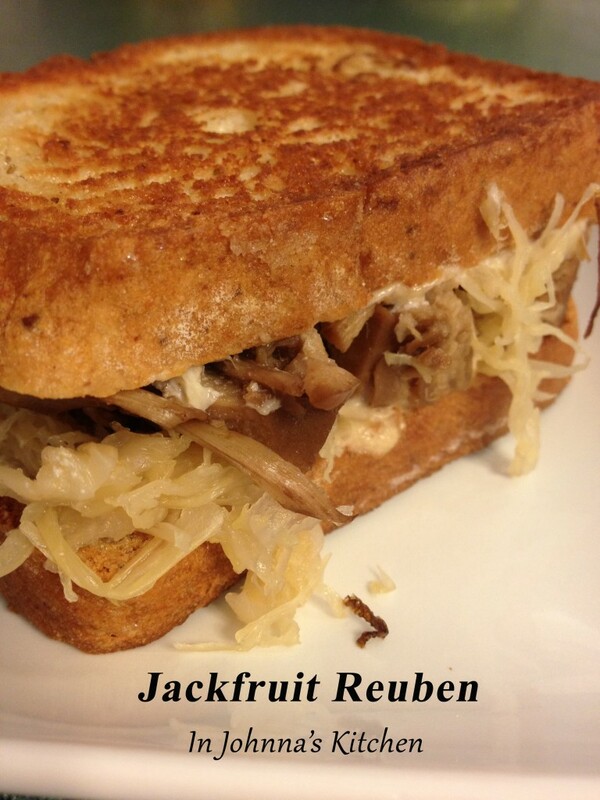 Jackfruit is proving to be very versatile in my kitchen. With a very mild flavor on its own, it absorbs the seasoning it is cooked in nicely. 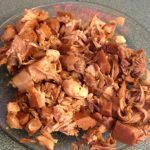 It’s inexpensive, minimally processed and contains one ingredient , making it much preferable to the meat alternatives I used to cook with often. So far I’ve created two styles of BBQ, KC and Carolina, a tamale filling for cute little bites and a taco filling with jackfruit. Now add to that a Reuben sandwich! Before I was gluten-free and watching how much dairy I eat, I would order a Reuben when eating out and have them hold the corned beef. 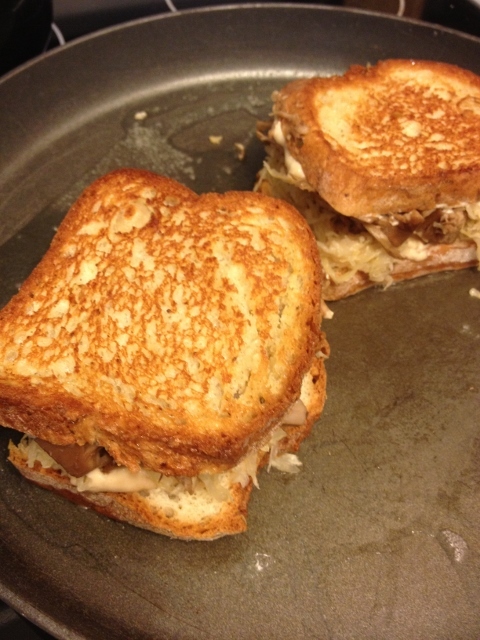 Cheese, thousand island dressing and sauerkraut on grilled bread worked for me. I really miss that flavor combination, so I’ve come up with a solution. This is completely dairy-free, gluten-free and meatless yet packed full of all of the flavors of a traditional Reuben sandwich. 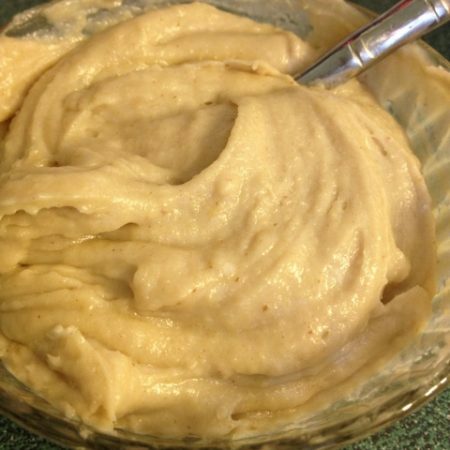 You can make all of it vegan with one simple switch, using agave nectar or another sweet substitute of your choice for the honey in the Thousand Island dressing. 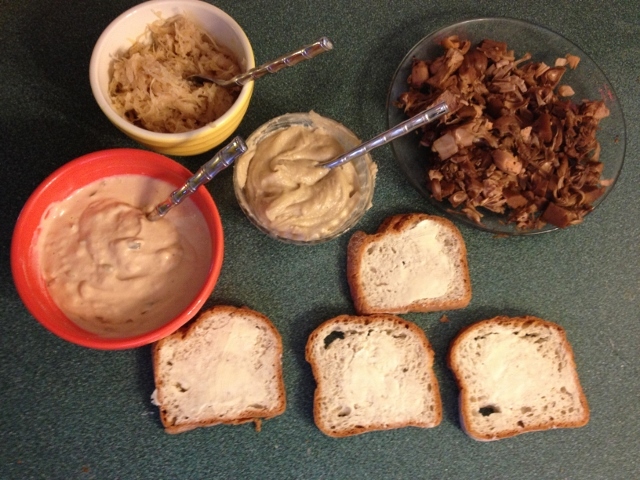 Below you’ll find three recipes: the corned jackfruit, a Swiss cheese spread and thousand island dressing. All are quick and easy to prepare and versatile! 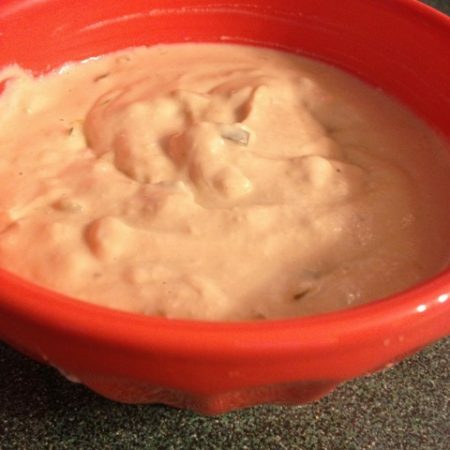 The Swiss cheese spread is great on crackers, the thousand island dressing is equally at home on a salad as it is on the sandwich. I hope you’ll think of creating these separately as well as bringing them together for a Reuben sandwich! Place second piece of bread on top, buttered side out, and add to griddle pan. 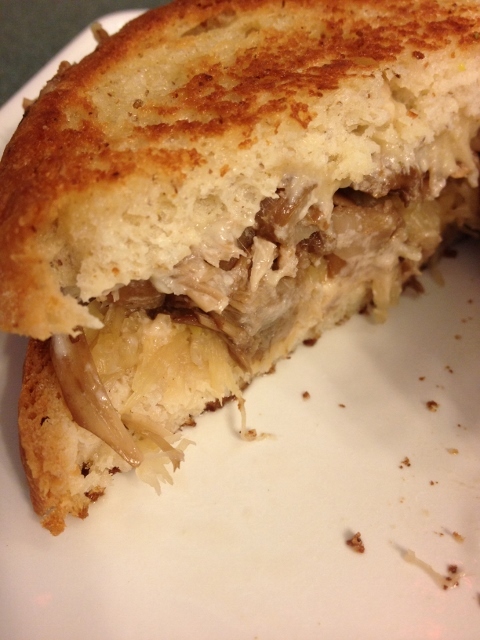 I added about 2 teaspoons of coconut oil to the pan and let it get nice and warm before placing the sandwiches in. Cook on one side until nicely browned, flip and repeat. Drain and rinse can of jackfruit. Place in crockpot. Add water, spices and apple cider vinegar. You may wish to place the spices in a piece of cheesecloth and tie up with kitchen twine, creating a spice sachet. Otherwise, you will need to pick the spices out by hand at the end of cooking, which is a pretty simple task. If you want the jackfruit to have the reddish flavor of corned beef, drop a beet into the crockpot at this point. It will not change the flavor and you will have a wonderful pickled stewed beet after cooking. After 4 hours, remove from crockpot and roughly chop the jackfruit. Add to Reuben sandwich or dip or eat with a fork. Delicious! Blend all ingredients in high speed blender (preferable) or in food processor until smooth. This will have a very thick consistency. Please note in the Thousand Island recipe below, you will need to substitute agave nectar or other vegan sweetener of your choice to make the recipe truly vegan. Place all ingredients EXCEPT pickle relish and onion in high speed blender (preferable) or food processor. Process until smooth. Stir in pickle relish and onion by hand. I’ve also created Reuben dip with these recipes. You can find it here. Enjoy! Thanks, Ricki! 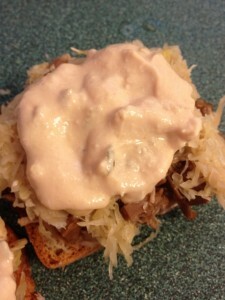 I love jackfruit and this Reuben is by far one of my favorite ways to use it. I hope you’ll give it a try! I really like the Swiss cheese on crackers, Shirley! And I had no idea on the pickling spices. 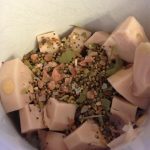 I initially bought a “corned beef spice” blend at Penzeys and realized it was very similar to pickling spices. Since pickling spices are much more readily available, I switched to that and the flavor is very similar. If I may ask, how close to Swiss cheese is this spread? Thanks for your question. To me, it definitely has the flavor of Swiss cheese. 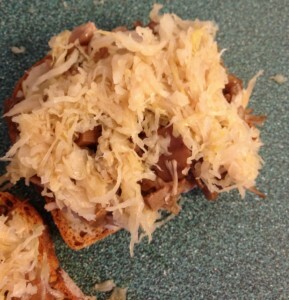 It makes a spread, not a firm, sliceable cheese but the flavor is much like that of Swiss cheese. I’d love to hear what you think when you try it! I am curious why you don’t soak the cashews. Does it create a different consistency? That’s a terrific question, Liz! For both the thousand island dressing and the swiss “cheese” spread, I prefer unsoaked cashews. The texture isn’t quite as silky as soaked cashews and has a bit more bulk and texture to the end product than when using soaked ones. Thank you! Looking forward to making it! I don’t own a slow cooker. 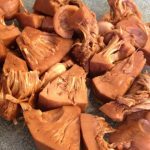 Is it possible to cook the Jack fruit any other way? Stove top, or oven? Reuben’s ate my favorite! Thank you for this delicious recipe! Sure, you could cook this on the stovetop. You may end up adding a bit more liquid. I would simmer of low/medium-low until the jackfruit just starts to fall apart. OMG ???? I just made this and it is AMAZING ??? ?, not gonna lie I saw the cheese and dressing part and thought ???? two things 1. Cashews, not soaked I dunno and 2. Lets see if the dressing and cheese turn out to be a disappointment like nearly all other cheese/ dressings I have tried since going vegan. This WHOLE recipe rocks!!!! I ???? to you and apologize for doubting your greatness ???????????????????????????? Well, you just made my day! I’m so glad you enjoyed it. Thank you!! I am glad to have made you day! I will definitely be checking out more on your site, love how easy the recipe was. 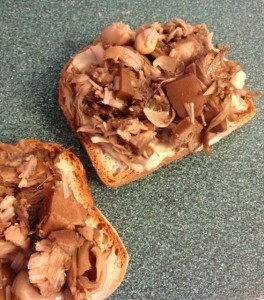 I will say I made one alteration to this and that is I used my pressure cooker vs. a slow cooker. It turned out great still I just googled for the equivalent and cooked on high pressure for 3 minutes the night before put it in the fridge then took it out and used simmer method/keep warm till ready to eat the next day. Thought I would share in case others wanted to use this vs slow cooker ????. I was vegetarian before going vegan officially January of this year, December last year I found out I have gluten sensitivities and dairy sensitivities so I cut both of this out and it has been a struggle, the gluten more of the struggle than dairy TBH. I love hearing you used your pressure cooker. I’m working on an electric pressure cooker/Instant Pot cookbook right now. Can’t wait for the Instant pot cookbook! I’m so excited to get it done and into everyone’s hands! Thanks so much for the conversion to the IP! I am just gathering my ingredients to make this today and wondered if I could use my Instant Pot. I recently made my jackfruit tamale bites in the IP–the jackfruit is EVEN BETTER in the IP. Just amazed by this kitchen gizmo! 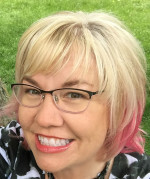 When do you expect your cookbook to be published and ready to sell? So looking forward to getting one! Hi, Robin! A cookbook is close. You can sign up for blog updates or follow along on Facebook for frequent updates and pre-order info. Thanks so much for asking! This looks amazing! Can I follow the same instructions using fresh jackfruit? To make any of my “meat” recipes with jackfruit, you will want canned jackfruit, the young/green variety. (You may also find this variety frozen, but it isn’t as readily available.) The fresh jackfruit, either whole or in slices/wedges, will be ripe. It is more ideal for desserts and will not shred like the young/green variety. The ripe version at the grocery store will taste like Juicy Fruit, very sweet. The young/green (think unripe) version has next to no flavor. I purchased almost all the ingredients this weekend, and plan to make this for Saint Patrick’s Day since I’m in the middle of a meatless March. I did have a question though. 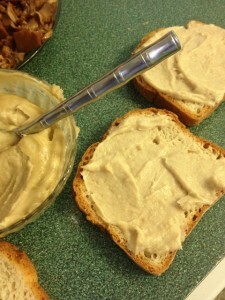 What’s the purpose of the Medjool Date in the cheese spread? Could you substitute something else for it? Hi, Robert! The Medjool date has two purposes: it adds just a touch of sweetness and it also acts as a thickener. You could try eliminating it completely, but I think you’ll find it is a nice addition. You are correct, honey is not vegan. I often recommend agave or maple syrup instead, as I’ve recommended honey OR agave in this recipe. This looks amazing! I have been looking for meat alternatives and this recipe I cant wait to try! I am gluten free (mostly) but have found cheese is usually the real issue, and I love cheese! Have you tried Miyokos? Yes! I love Miyokos. Recently I’ve found the Miyokos cream cheese and butter at Trader Joe’s. I often mail order cheese from them, so many wonderful varieties! THANK YOU FOR YOUR GREAT RECIPES. I CANNOT USE CASHEWS WITH A GRANDSON WHO HAS TO BE AVOIDING THEM AT ALL COSTS. WOULD YOU HAVE A SUBSTITUTE FOR THE CASHEWS IN YOUR DRESSINGS? Yes! I have a dear friend who also must avoid cashews. Sunflower seeds are one option, pumpkin seeds are another. The flavor of both won’t be as sweet as cashews, so you may need to adjust accordingly. Sunflower seeds is my go-to in these settings.